Zo and I decided for date night we were going to make a seafood dinner, we boiled some crab, steamed some lobster and while zo was working on desert I tossed together these Shrimp Fritters. If you commonly frequent Cooking for Zo then you know that I love Conk Fitters and have posted an Abalone Fritter Recipe on the site. Shrimp Fritters and Calamari fritters tie for my second most favorite Fritters! 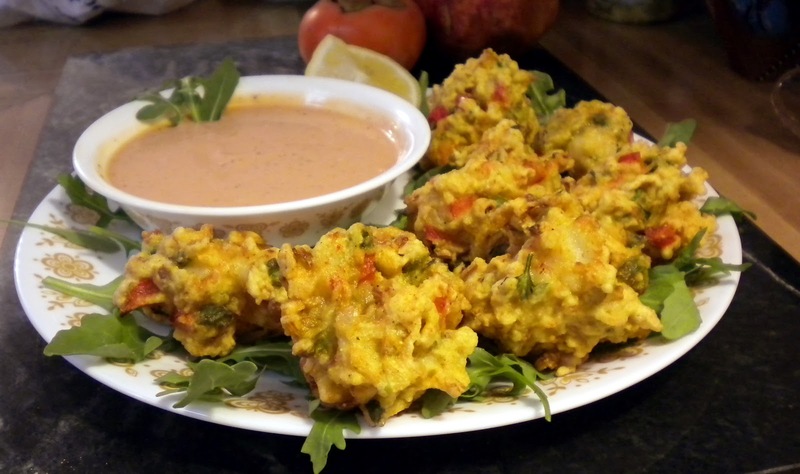 If you do not frequent the site then let me tell you what a Fritter is. It is basically a fancy seafood hush puppy. If you do not know what a hush puppy is then you have never been to any kind of Southern Seafood Reasurtant worth its salt! This shrimp fritters were so good I made them a week later for an office party, everyone there enjoyed them as much as Zo and I did! So enjoy! In a large mixing bowl mix Shrimp together with vegetables, parsley, shallots and garlic until even. By hand fold in eggs and half and half until mixed well. By hand fold in flour, seasonings cornmeal and cornstarch until evenly mixed. Cover and refrigerate batter for 45 minutes to an hour.